Tonight at our Reiki Share we had a plant swap. I brought leafus giganticus, raspberry roots, bicolored artemesia, alien plant; calendula, cilantro, and sunflower seeds. I brought home a lamb's ear with a hitchhiker: day lily or narcissus, not sure. We skipped our usual check-in, and I missed that. Felt like I didn't connect with some people. Too much to do. We did role-playing orientation for three new practitioners. That took up the first hour. The second hour we presented sound therapy, which is not Reiki, but was fun. Two people ( M & me) brought tuning forks and presented what they (we) knew about sound therapy. Then we tried it out. I felt strangely tense during my sound therapy session. I got a heavy pain in my frontal lobe with one fork. Dissipated as soon as the practitioner moved on to the next fork. So an interesting evening. The end to a sunny May day in Maine. Loose minerals: smoky quartz, tourmaline, garnets. That was my quest. A local mine: 0.4 miles, take all you want, keep it, no fee. Early spring, I figured no black flies or mosquitoes. A rainy morning, I figured no crowds. Vague directions, off I went. I had a nylon bag for the rocks and crystals. I had gardening gloves to paw through piles of rocks. I stopped to buy a small shovel and pictured myself digging through piles of dirt and rock. The sun came out and it was hot. Found the vague location: an upscale housing development, with mansions, a golf course, and fancy street lights. There was a park, with trails. I remembered the last park, how I got lost in the woods. A map would be good. I opened the map box and two hornets zoomed out. I jumped back and screamed. Tentatively re-approached, opened the lid, and quickly grabbed a map.I looked at the map and read the descriptions of the trails. No mention of a quarry. A ravine trail, perhaps the quarry was there. I set off. There was a lot of construction, and piles of interesting rocks along the road. I picked up a few chunks of quartz, maybe 10 pounds in my nylon bag. Then I wandered around the ravine trail. There was a meandering stream, woods, and blueberry fields. I was in a nature conservancy. Do not collect specimens! Leave nature where you found it! I picked up a stray rock in the ravine, anyway, one of few. The trails were woodsy, piney, ferny, steamy, and streamy. I got tired. There was no quarry, and no rocks. Time to head back. The trails were well marked and well-maintained, but I was on a trail that wasn't on my map. Where was I? I kept walking: went over a long scary metal footbridge, through a wet patch, along some railroad tracks, and into a housing development: more mansions, long driveways, and big beautiful yards. Good, I was tired and glad to be nearly back to my car. Where was it exactly? I looked at the GPS on my phone; oh, I was a long way from my car: a long way by road, shorter if I went back through the woods. Two women were sitting in the sun, in a driveway, with two toddlers. I asked for directions, secretly hoping they would drive me back to my car. They said they had no idea how to get where I wanted to go. I headed back to the woods. I'd been hiking for 2 hours: carrying a bag of rocks, lost, sweating through my clothes, old, thirsty, and tired. I imagined that maybe I got lost because of that rock I picked up in the ravine. You know, the one I wasn't supposed to collect. It was squarish, white, with streaks of smoky quartz crystals. I found it in my bag and set it beside the trail. I lumbered along, panting and sweating. I saw a turtle on a sunny log in the stream. A blue jay flew onto a low branch ahead of me four times. Swoop, land, call - in that metallic jay squawk. A deer bombed across the trail, white tail up; the ground shook. With phone GPS I found the right trail, found more rocks (lots of smoky quartz, some black tourmaline, mica), and found my car. Pretty sure I had 60 pounds of rocks by the end. Or 100. Had to carry with both hands and a sharp rock ripped a hole in the bag. I trudged; my legs ached. The car. Bliss. Freedom, movement, and air conditioning. Headed home. I stopped to shop along the way. I purchased mesh bags to cover my blueberry plants and enjoyed an unsuccessful search for a shoe cupboard. Home, with rocks. both, one must train one's mind. Stay focused. Notice your thoughts, then let them go. Bring the focus back to center. What is center? A sound, a vision, an action; doesn't matter what it is. It's the bringing back to focus that is the work of meditation. And that helps with Reiki. When sharing Reiki and my mind drifts to my To Do list, or what I will eat next, or lower back discomfort; I bring my mind back to center. What is center: Reiki symbols, ethics, and intention. Breath. Back to Reiki. Tonight my mind kept wandering to the endocrine system and chakras. I kept visualizing the endocrine organs: pineal, pituitary, thyroid, parathyroid, adrenal, pancreas, ovaries & testes. Then I brought my attention back to my client's comfort. Back to Reiki symbols, ethics, and intentions. Then my mind wandered to the cardiovascular system. oops. Back to Reiki. Best part of holding my grandson: when I feel his small heart beat against my sternum. Wish I knew more about it. Is it chemical? It is in people, right? The flow of ions across cell membranes. And batteries, aren't they full of chemicals? Acids and salts? But lightning. That's not chemical. Is it? Why I want to know more: because Reiki is electricity. I haven't studied electricity since grade school science classes. Suddenly I want to know more. When you live in the city you notice. I can see almost 40 houses from my house. All with yards, cars, driveways, dogs. One neighbor has a pool. One house is empty. Over there, she's a beautician. That way, she's hearing impaired and has a barky little dog. He stands in his driveway and stares at his feet. She cleans houses and has lots of company. He's a flirt, borderline lecher. OK, he's a lecher. They go to church every Saturday at 3:45 pm. He plays horseshoes and drinks beer with buddies on weekend afternoons. Not that I'm standing at the windows; I don't even notice that I notice. But I notice. So I just noticed. Where is her car? He has a red truck, she has a white car with a pink ribbon on the license plate. They have a little girl; I remember when they brought the baby home and she cried at night. They put up a sandbox in the backyard last spring. Mom's mother visits sometimes, the mother-in-law. Dad's dad parked his truck in the yard and disappeared. Jail? Where is her car, mom? Mom, the mother-in-law, the little girl: where are they? He hasn't mowed the lawn yet, and I've mowed three times. No barbeques, no sandbox action, no laughter. What happened? Second time in 4 years. A woman I knew died this way, a big blond pleasant nurse: Ellie P.
I wanted to check for water in the basement after a night of rain. First thing I did after getting up, stepped on the cellar stairs. Slid, bumped, and scraped all the way down in a heightened awareness of vision and sensation. Tried to grab, tried to stop, held my head up as sights blurred. Hit bottom, ran back up and took some homeopathic arnica. Did self-Reiki. Inspected and bandaged abrasions. Wondered how long it would take to be found if... you know. The humidity was a little high, turned on the dehumidifier. Welcome, summer. The soil today was warm, wet, and soft. Light rain, mild temps. A good day to plant. So I did. The artichoke, in the sunniest spot in the garden. The seedlings I've nurtured since March: eggplant, basil, and hot peppers. Instant garden. Planted seeds: cilantro, marigold, sunflowers, marigolds, beans, carrots, cosmos, and zinnias. Yesterday I spread 3 bales of hay and 20 cu feet of pine chunks around the edges and between the rows. Today I planted. Today I admired the passing daffodils, new narcissus and phlox, chickadee visit, and the song of the cardinal. Any artichoke farmers out there? Will a seedling grow to maturity in Maine, and produce many delicious organic artichokes? My son and DIL gave me a seedling for Mother's Day. It looks healthy: light green saw-toothed leaves. I remember seeing plants in California. In San Diego, Old Town. And in a Montessori garden in Sacramento. The plants are tall and sturdy, with purple flowers and multiple green globes. They seemed to thrive in hot and dry. Maine is often cool and rainy in the summer, so we'll see. I'll give the seedling the sunniest spot in the garden. So much of the garden is shaded by the Japanese maples, the crabapple, the pine, and the house. There is one super-sunny spot, and the artichoke will go there. My garden recharges my energy. I love to putter around there, soaking up sun and green. When you have leftovers and no one wants to eat them? Use as pizza topping or add to pasta. That's what my son, the chef, advised. 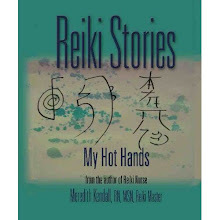 Using this book in Reiki class. I wrote it as a text book; still weird. A student gave me a radon kit. I precepted her through a community health course where she presented the ramifications of radon via lecture, bulletin boards, posters, and newspapers. I went to one of her lectures, and brought 8 nursing students. She was knowledgeable, relaxed, and personable. She brought homemade chocolates and cupcakes; she's a gourmet cook with high standards. The goodies were good. I never really wanted to know my radon risk because really, what can one do about the bedrock beneath one's home? Oh, one can do something. Fans. Exhaust fans. Ok, with that cheap fix, perhaps I do want to know. Planned to buy a kit. She beat me to it, and gave me one. I opened it, looked like complicated instructions and I was busy becoming a grandmother. I set it aside. Got it out again. Instructions look simple. Set it out for 48 hours, mail it in. That's it. Why? Radon gas kills more people than car accidents do. Radon causes lung cancer. It's easy to divert the gas. That's why. I start my home test tomorrow. Total love without the physical pain and emotional earthquake. Appreciation for the man who is my son and the woman, the dear woman who bore and is caring for this child. My son is gentle, thoughtful, and caring. My DIL enraptured by her new son, but also respectful and grateful to her partner. I can see them working to be kind to each other in this time of upheaval, this transition to parenting. Both are completely focused on the needs, safety, and health of their new baby. And yet, they seem to need me a little. For companionship, calm, witnessing, and validation. To say, "oh yeah, that's normal," and, "good job!" I fill and empty the dishwasher. I knit blankets, rub backs, and drive. I cheer for them. They need me a little, or maybe it's more kindness. So it's bliss. Earthly bliss. and the new mom. All those changes. Let's just talk physical. Her body stretches out, her center of gravity changes. Organs get squished. Hormones loosen joints so her bones feel like rubber. Labor starts. "I got this," she thinks. "What's the big deal? Let's go for a walk in the woods. I think I'll make a casserole or sew a quilt." Hours of this. No prob, well, just maybe slight prob, but hey, we're almost there, right? Uh, no, not quite. It gets more intense. Oh. Talking stops as her focus goes inward, goes toward riding the wave and making it to the other side. It's painful. Time stops. There is no past, no future, no end, no baby. No room, no people, no clothes. Just waves of pain. You could move or not, won't matter, still hurts. Pain becomes your whole being. You breathe, you endure, you rest. Are you going to crack open? Split open? Please make the pain stop. You grunt and rock. The baby's head begins to emerge. In the end you scream. The baby's face is there. Then the shoulders, then tiny feet and he is born. Then the placenta, oh god, more pain. Why did no one tell you about this? Pant, breathe, rest. In the days to come your body will continue to change. Your bones and organs go back where they once were. Your belly is still jelly, and no pants fit. Your legs and arms are weak, why? Then the milk comes in and your breasts are enormous and enormously painful. They're like rocks. Rocks that feel pain, how can that be? Your spine wants to crack back into place. Hips too. Breasts still hurt. Those afterpains too, as the uterus shrinks. No one told you about that either. But the baby. The baby is bliss. He's a miracle. You can almost forget the pain when you look at his face. Note to readers: I'm a new grandmother. This post is about my memories as a new mother, memories recently rekindled. Another note: birth is easier with Reiki, massage, and love of family & friends. They live on blood, the nutrients from mother's blood, in an exchange that occurs in the placenta. Then they're born and they switch to mother's milk. Mother's blood to mother's milk. They start to breathe air. If they open their eyes in the womb, not much to see. They they're born and there's lots to see. In the womb sounds are muffled. Birth: must be a cacophony. All the senses come alive, breathing and nutrition change dramatically. And this is just the baby. How about all the changes for the mom and dad? - how you would describe how you adapt “traditional” Reiki in a conventional medical setting (vs. your own private practice for example)? In your books, you speak about not using stones for example, or not using the same terminology. - how would you describe how Reiki works in a conventional medical setting (vs. your own private practice)? - Would you say that you try to link Reiki to scientific evidence? - would you have any comment on your understanding of how Reiki changes mainstream practice physicians’ opinion (when you work in a conventional setting) on science? I practice Reiki in a conventional (American Medical Association western biomedical) setting: an outpatient cancer center. I don't have a private practice, I don't have time for that. I teach 50+ hours/week, share Reiki at the cancer center, volunteer, manage my life & home, and spend time with family and friends. So, no time for a private Reiki practice. Actually, it's difficult here in Maine to rely on Reiki for a livable income. Our population here is sparse (Maine is 98% trees), and people have neither the cash nor the interest to support Reiki practitioners. I adapt by adhering to the protocols I established when I proposed the Reiki program to health network administrators. I instruct my team members (volunteer Reiki practitioners) to follow standards. We try to be consistent, and we do just Reiki, as we understand it. Though many of us are interested in other integrative modalities, we share plain Reiki, as we understand it. We try not to adapt Reiki; we adapt ourselves. How does Reiki work? I don't know. Who does? I avoid that question and advise my practitioners to avoid it too. Who can explain it? I tell my clients what I'm going to do: where I'll place my hands and that I may not speak. I tell them to keep their clothes on, get comfortable, and to tell me if they wish to change any elements of the situation. I do try to link Reiki to scientific evidence. 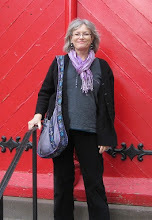 I teach Reiki as a 3-credit college course at my small community college and also at the U. In those courses the students read current Reiki research. I'm fascinated by research. I'm conducting research at my cancer center: clients' perceptions of pain, stress, and happiness before and after Reiki. I've been doing this research for 9 or 10 years. A physician colleague is presenting my research at a medical conference in Miami FL in 2 weeks. So I guess my Reiki work might influence this one particular physician. Another author in the family. My nephew kept a journal during a wilderness trek. He's editing and working on getting it published. It's compelling, a story of big trouble and spiritual awakening. A quest for balance, fulfillment, and the meaning of life. There's something good to eat under the burning bush. The young cardinal pair are back again today. He's bright red, with the color concentrated most deeply around his face. She's dove gray with a dark pink beak. They hop around like bunnies, rooting in the old leaves like truffle pigs. He's better at finding stuff than she, but he shares. Sweet. I remember cardinals from childhood years in Illinois. Never saw them here in Maine til the climate change. Now we have cardinals. Just mixed up another batch of laundry detergent. Big boxes of baking soda, washing soda, and borax cost me $10. My last batch lasted 7 months, would have lasted 8 or 9, I still had plenty left. Made a new batch so I could gift some. Mix the dry ingredients, then add essential oil to scent as desired. Of course that increases the cost. I like lavender. It's good to add some tea tree oil too, for its antiseptic properties (antibacterial, antiviral, antifungal).